Ok so the recipe is actually as most of us make it , call is Chappli or Seekhi more or less the same,ok in Chappli you add the tomatoes too,but here we dont, and I just added two extra things in it, and I rolled it in a new manner I lately saw here on our German Tv and it turned out what you see here! So mix all the ingredients in the minced meat, except the ketchup, knead well, not in the machine it should be a bit coarse!! Leave it in the fridge for an hour. Now take a freezer bag, open the sides, so it looks like a long sheet. 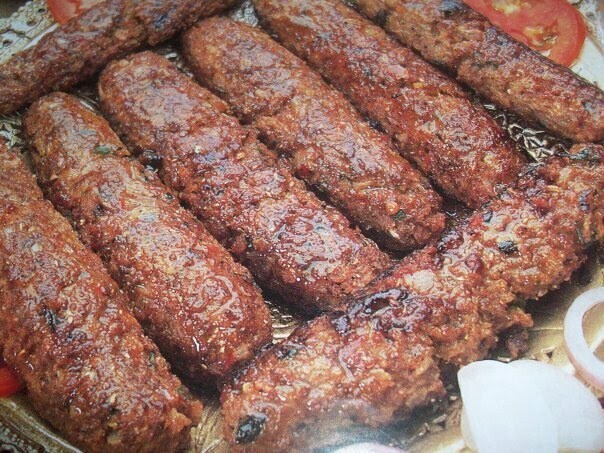 Make seekhi kababs with a bit more quantity of minced meat as usual so they will remain bulky after frying too. I make it with a help of my thick wooden spoon, by making them on the back of the spoon which I oil before making, so they slide easily with out sticking . Now place them on this nylon sheet, over lap the second edge and roll it with your palm as if you are rolling a chapatti to and fro, you’ll see it will get a very smooth surface and become round and thick, smooth both edges by pressing the sides time to time. Roll it at least 5-6 times!!! I made 12 kababs from ½ kilo so they were really thick. Now you can shallow fry them on a low heat as they are thick it will take time, and as they were nearly done I brushed the ketchup on both side turning around , to give it a glaze and nice colour. Brush some butter on them before serving, it smells very good when the butter melts!! Put no fresh coriander or mint in it as they turn black while frying!! !